"Ex Silvis, Pugnabimus" — "From The Forests, We Will Fight!" Sasquatch: The might of Cascadia is in your arms! Besides serving your country, you will also be improving yourself. Sasquatch Militia will teach you many valuable skills that today's employers are looking for in Sasquatch. You will gain a sense of determination and confidence that will help you succeed. And you will also experience compatriotship with your fellow Sasquatch as you work together to secure the freedom of the Republic of Cascadia. The Republic of Cascadia needs you now, more than ever, in these trying times. Do your part for your nation and don't let another Sasquatch take your place in the ranks of the Sasquatch Militia. Enlistment stations can be found throughout Cascadia's forests, just look for the poster of Uncle Sas. The Cascadian Sasquatch Militia is the most advanced hominoid fighting force in the Western hemisphere (second in the World only to our Tibetan ally, the Yeti Liberation Army). Militia members are highly trained in combat, survival, and organizational skills. When you enlist, we will make you into an army of one Sasquatch, able to take on any challenge that faces you. Cliff invaders, beware! Cascadian Boulder throwers shower rocky death from above. Learn to use your feet to squash your foe or his equipment. A basic skill needed by all Sasquatch Militia stomptroopers. 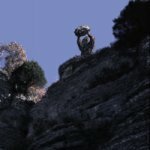 Take out the enemy safely from the top of cliffs. Boulder troops are the first line of defense of the Sasquatch Militia and we'll teach you how to become one. Close combat against a number of foes? They'll be no match for the blunt force of a swinging log. Learn how to choose and uproot dead trees, and proper swinging techniques to avoid back injuries. Pulling your enemy's limbs from their sockets may sound cruel, but they would do it to you with no hesitation if they had your might. Learn the best way to do it quickly and efficiently for a minimal amount of suffering. The salmon: tasty as a snack but, when in trained Sasquatch hands, deadly as a weapon. Salmon wielders are the silent assassins of Cascadia - waiting, hidden along trails, to take out enemies swiftly and silently. Psychological warfare techniques that any Sasquatch can master. The enemy will be mentally defeated before they ever set eyes on you. You will also learn Code Howling for use in secure military communications. You will be instructed in a number of techniques by Migoi Masters from our allies in Bhutan, including invisibility. Learn why the two most dangerous weapons that a Sasquatch can have are his body and mind. 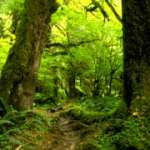 17 Sasquatch Militia salmon wielders are hidden on this trail. Can you see them? No, you can't and neither can humans. Your native Sasquatch foraging skills will be enhanced with training on finding food in human habitats. Learn where humans keep edibles (mini-marts, garbage cans, pet shelters, etc. ), poisonous substances to avoid, and how to use "money" to trade for food. You will also go through Food Aversion Desensitization so you can take advantage of detestable but otherwise harmless human food (such as food that has been cooked or filled with preservatives). Learn how to avoid being the subject of a television special on the Fox Network through the complementary arts of camouflage and concealment. We'll teach you all the secrets to making yourself disappear completely before the enemy's eyes, not only in forest environments but also in human habitats. If captured in battle, human enemies may try to put you on public display in a zoo or even subject you to harmful medical tests. We will teach you first how to avoid capture but also what to do if you are captured, including methods of escape and your rights as a sentient Hominoid prisoner under International Law. Aluminum Foil Deflector Beanies will protect you from psychotronic warfare. Learn more about this important combat gear. Blocks psychotronic mind-control rays used by our enemies. Light-weight armor that can be augmented with readily available supplies. Not effective against human firearms, but it doesn't need to be since Sasquatch Militia will teach you how to attack smart and stealthily. Makes you undetectable in rainforest warfare and provides you with valuable "pockets" (the use of these will be explained during basic training). Confuse cryptozoologist trackers working for our enemies. Imported from South America where they are used by the secretive Curupira hominoids of Brazil. Reflects the sun to daze the enemy or for signaling. Can also be used to scare superstitious New Age Southern Californians into retreating by holding aloft and making fake chanting noises. ORE (Octopus Ready to Eat) rations are nutritionally balanced octopus-based bars for use when other foods aren't available and designed to keep you growling, not your stomach. Are you unable to join the Sasquatch Militia due to age, physical impairment, mange, or being human? You can still show your support for our Sasquatch defenders. 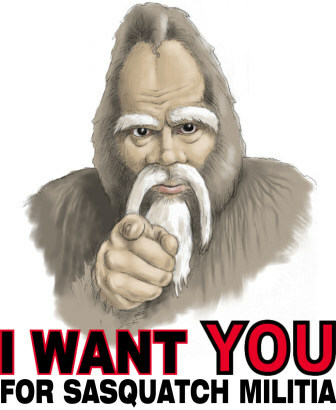 If you run a website for Cascadian Sasquatch, copy the free Uncle Sas mini web-poster on the left onto your site to help recruit Sasquatch for service. Also, you can get Uncle Sas wallpaper for your computer or neighborwood Hominoidnet kiosk.